New research finds that pregnant women who get so sick from the flu they're hospitalized in an intensive care unit are at high risk of having a baby with health problems. NPR's Patti Neighmond reports on the study in the journal Birth Defects Research. PATTI NEIGHMOND, BYLINE: Women's immune systems change when they get pregnant, and they're more susceptible to complications from the flu. Dr. Sonja Rasmussen with the University of Florida College of Medicine. SONJA RASMUSSEN: That means they're more at risk of getting pneumonia. They're more at risk of needing to be hospitalized and even being admitted to an intensive care unit. NEIGHMOND: As a pediatrician, Rasmussen wanted to know how this might affect newborns. She compared 490 pregnant women with the flu to more than 1,400 who did not have the flu. 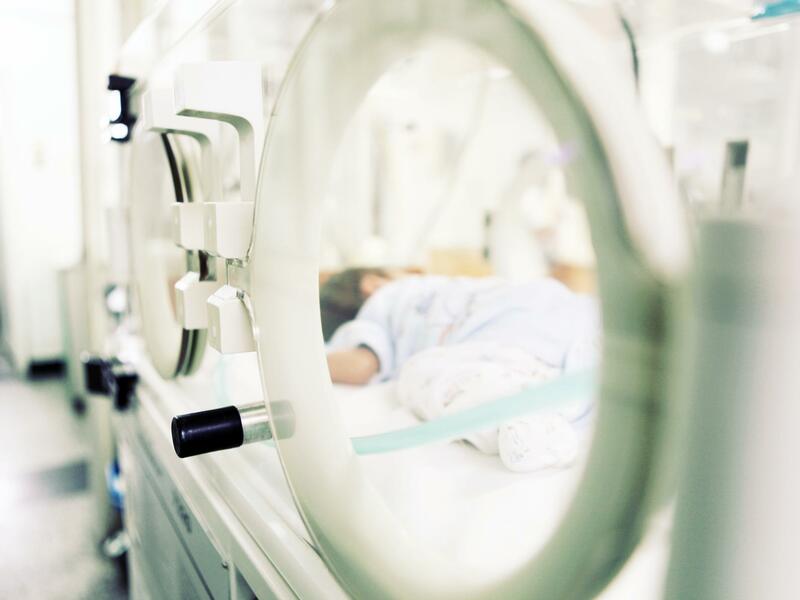 She found those who got severely ill from the flu and were hospitalized in intensive care units were significantly more likely to have babies with health problems. RASMUSSEN: More likely to deliver their babies too early - prematurely - more likely to have a baby of low birth weight and were more likely to have babies with low Apgar scores. And that's those scores that tell how a baby's doing after birth. NEIGHMOND: Measuring things like heart rate, reflexes and breathing. Women who got the flu but were able to stay at home and even those who were hospitalized but not admitted to the ICU had no increased risk of health problems for their newborns. Rasmussen says it's not clear how being in the ICU affected newborns. She doesn't think it's the flu virus itself. RASMUSSEN: When moms are in an intensive care unit, they oftentimes are needing help with breathing. They're needing to have a ventilator breathe for them. So it may be that they had some period of time that they weren't getting good oxygenation - you know, weren't breathing well enough to get good oxygen to the baby. NEIGHMOND: And when patients have trouble breathing, they're likely to have trouble eating, which could mean they weren't getting adequate nutrition. Rasmussen says the findings highlight the need for pregnant women to get vaccinated against the flu. OB-GYN Dr. Denise Jamieson with Emory University School of Medicine says only about half of all pregnant women today get the vaccine. DENISE JAMIESON: We've been recommending the vaccine since the 1960s, yet we have not been able to increase the vaccination rates to protect most women. NEIGHMOND: And their babies. Jamieson says some of her patients think the vaccine will make them sick. It can't, she says, because it's an inactive killed virus. Others think it's not safe. Not true, says Jamieson. JAMIESON: This is a vaccine that we have been giving in pregnancy for many decades, and there's no indication that there are specific concerns in pregnancy. It's a safe vaccine. NEIGHMOND: When women get vaccinated, they make antibodies to fight the virus. Those antibodies can cross the placenta and protect the baby, which is important, says Jamieson, because infants' immune systems are just beginning to develop. And they can't get the flu vaccine until they're 6 months old. Patti Neighmond, NPR News. (SOUNDBITE OF YASUAKI SHIMIZU SONG, "108 DESIRES") Transcript provided by NPR, Copyright NPR.